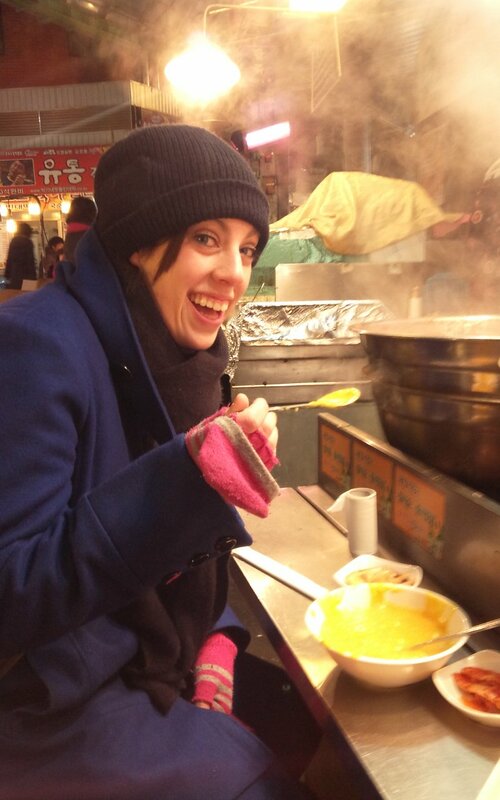 I don't know why I have only walked through this market and not eaten in it, but the other day it was FREEZING and Catie and I decided to go get some street food. 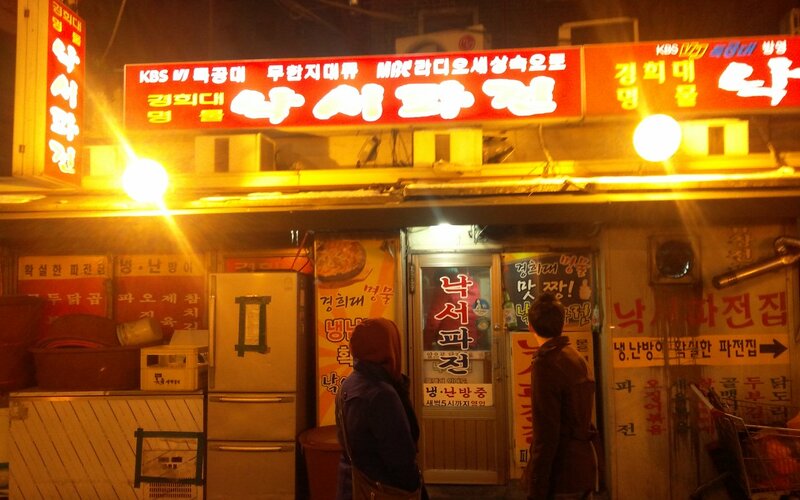 Gwanjang Market (관장시장) is located pretty close to Dongdaemun, and would be most accessible from Jongo 5 Ga (I think exit 8). From there, you will see a sign for the market. 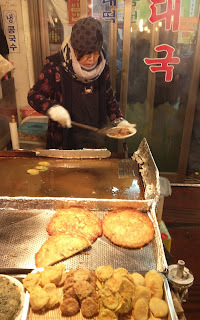 Like most big markets in Seoul, you can find plenty of things to buy here, but my biggest draw to an area is always food, and one area of the market has stall after stall of bindedeok. 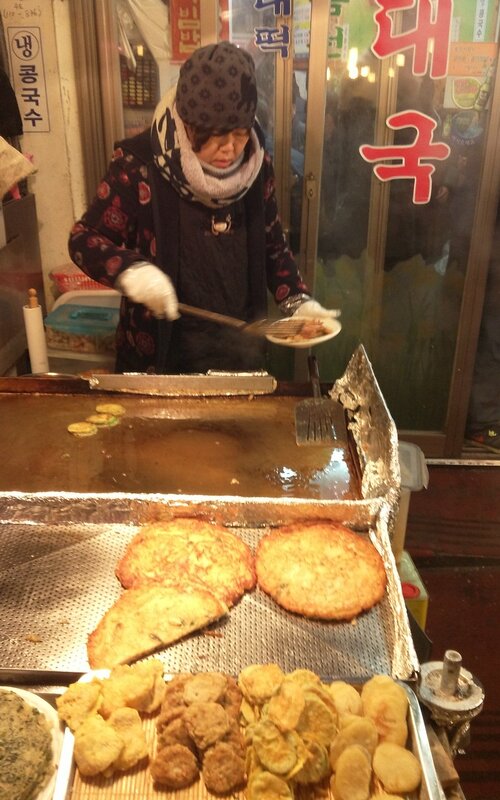 Bindedeok is a type of jeon, which Koreans like to call Korean pizza but is more similar to a healthy pancake. Unlike other types of jeon bindedeok is made with mung beans. This dish was first made in the 1670s and literally translates to poor persons pancake. Thanks wikipedia! We enjoyed our bindedeok with makgeoli and some hobak juk (pumpkin porridge). The stall we sat at was particularly full so we had to take the outdoor seating. 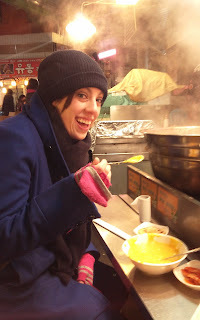 Warming our hands above our pumpkin stew and enjoying our bindedeok with soy sauce and makgeoli was actually quite romantic and I'd recommend this market as an impressive date spot to bring a foreigner who doesn't have much experience with Seoul. 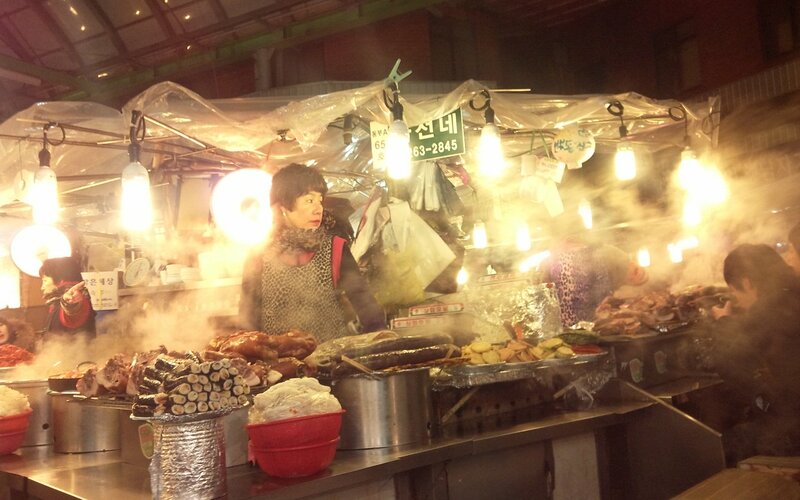 Just try to stay away from the pork intestine smell. Because of the wind, every once in a while we'd get a huge whiff of this Korean specialty, which, no matter how much I smell it, I have never got used to. The 8th Wonder of the World! Banaue!